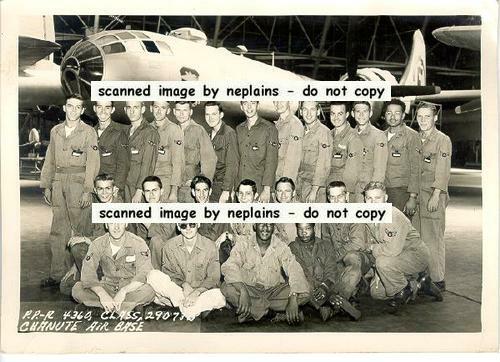 Photo of 24 men in military uniform, near a plane (Could be a B-29 Superfortress war plane). The name under the nose art is obscured by one of the men. The tail marking looks like "E" in a circle. Only two uniforms show a legible name -- DUNCAN and KILGORE. Caption at lower left: P.P.-R 4360, CLASS, 29073B ... CHANUTE AIR BASE. Measures 7 x 5 inches. Photo clean with very nice detail. Corners are only gently bumped.